Brian Leetch will join Stanley Cup Champion teammates, Mark Messier and Mike Richter, in the rafters of Madison Square Garden as the Rangers are set to retire his No. 2 during a ceremony Thursday night. "When we talk about what it means to be a New York Ranger, Brian Leetch is the player who exemplifies that model," Rangers president and general manager Glen Sather said. "There is no higher honor to grant Brian than to have his number raised to the rafters of Madison Square Garden." Those lucky enough to be in attendance Thursday night are set to see the Rangers honor one of the key components which brought the Stanley Cup back to New York. In 1994, Leetch tied a career high scoring 23 goals during the regular season. In the playoffs he played on an even higher level. 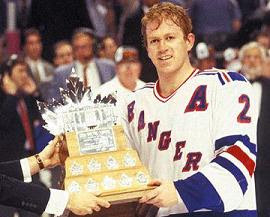 While becoming the first American-born player to ever receive the Conn Smyth Trophy given to the MVP of the playoffs, Leetch scored 34 points in 23 games. The defenseman was only held scoreless four times (The Rangers lost all four games Leetch failed to score). He scored 11 goals overall in the playoffs and ended four games with game winning goals; three of those in the deciding games of the series. "We shared the same desire and commitment and dream to win the Stanley Cup here," Messier said. "We were able to go through the tough times together and go through the good times together, but ultimately through it all we did something that we set out to do." Leetch skated 17 seasons as a Ranger and scored 247 goals and 1028 points during his entire NHL career. He is second in Rangers history in games played (1,129), leader among defensmen in goals (240), assists (741), and points (981). He won the Norris Trophy as the leagues top defenseman twice in 1992 and 1997. He also served as the Ranger captain during the 1997-2000 seasons. Leetch's professional career began in 1986 when the Rangers drafted him in the first round, 9th overall. He broke into the NHL a year later picking up 14 points in just 17 games. During the 1988 season, his first full season, he won the Calder Trophy which is given to the top rookie in the league. His Ranger career ended in 2004 when he was sent to the Toronto Maple Leafs as part of a rebuilding process. They acquired a pair of prospects, Maxim Kondratiev and Jarkko Immonen, as well as a first-round pick in 2004 (which became Lauri Korpikoski) and a second-round pick in 2005 (which became Michael Sauer). The deal was not popular with fans and ultimately has not paid off for the Rangers. Kondratiev was dealt two seasons ago in order to rent Petr Sykora for an ill-fated postseason run, while Immonen has returned to his native Finland after failing to impress with the Rangers. The jury is still out on Korpikoski and Sauer, both currently playing for the Hartford Wolfpack. After the lockout Leetch played a final season with the Boston Bruins before deciding to walk away from the game. In 2007 he told fans that he always wanted to be remembered as a Ranger. "I always say, if anybody remembers me as years go by, if they say, 'Didn't you play for the Rangers?' that's good enough for me," he said. "If I played long enough and had enough of an impact that someone can at least remember that I wore the uniform that I played in for all those years." Ever humble, tonight the reluctant superstar gets his due.